Robin Copeland and Liam Williams have been banned for two weeks. 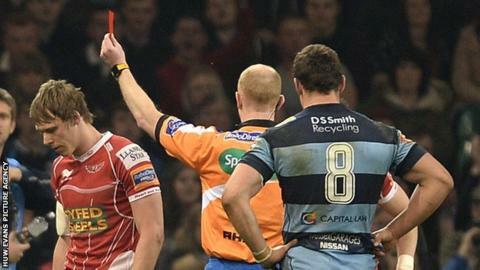 Cardiff Blues number eight Copeland was red carded for a stamp on Williams in the Blues' 17-13 win at the Millennium Stadium. Scarlets full-back Williams also got his marching orders for two yellow cards, but was cited over the first offence for a dangerous tackle that took out an opponent in the air. They appeared at separate disciplinary hearings in Dublin on Thursday. Williams and Copeland clashed at a ruck in an incident that saw both players sent from the field, although they have the right of appeal. Wales back Williams deliberately killed the ball, an act that saw him shown a second yellow and sent off, but Copeland had stamped on the full-back's head and was shown red. The Wales and Scarlets full-back had been shown a yellow card earlier when he tackled the Blues and Wales winger Alex Cuthbert while he was in the air. The independent citing commissioner at the match cited Williams for the dangerous tackle, in effect upgrading the yellow card to a red card. If their bans stand, the pair will be available for the final game of the regular Pro12 season - which sees the Blues travel to Parc y Scarlets for a re-run of their Millennium Stadium clash.